This school year, SCS partnered with the Sitka High School Construction Tech program to explore and demonstrate ways that young-growth red alder and Sitka spruce from the Tongass can be used in building and woodworking. The projects that resulted are profiled, along with others from throughout the region, in “Alaskan Grown: A Guide to Tongass Young Growth Timber and its Uses,” published by SCS this month. DOWNLOAD a version for printing. Whether you are a builder, woodworker, consumer, or simply interested in the growing conversation around Tongass young-growth timber, the guide profiles projects throughout the region and shares practical insights about the quality and performance of local young-growth in a variety of applications. It also discusses basic challenges and opportunities surrounding the eventual U.S. Forest Service transition to young-growth timber harvest on the Tongass, which was announced in 2010. 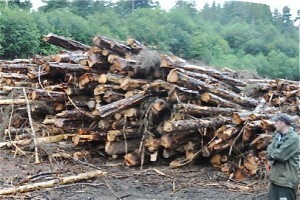 Funding for this guide was provided by the U.S. Forest Service and the National Forest Foundation as part of an ongoing effort to support sustainable timber harvest and local markets in the Tongass National Forest. The purpose is to invigorate markets for Tongass young-growth timber products, particularly in Southeast Alaska, by exploring their performance in a variety of interior and exterior applications. By sharing practical information, broadening the knowledge base, and connecting local producers with consumers, we hope to help builders, woodworkers, resource managers and others make more informed decisions about using Tongass young-growth. We know there is significant interest in the use of young growth, and we believe Southeast Alaska communities can sustain small young-growth timber operations that support local expertise and sustainable economic development. Harvesters, processors, builders, and consumers throughout the region are interested in realizing this vision. We hope that this guide will be one small step toward expanding and informing this conversation. Stewardship Contracting: The Right Tool for the Tongass? 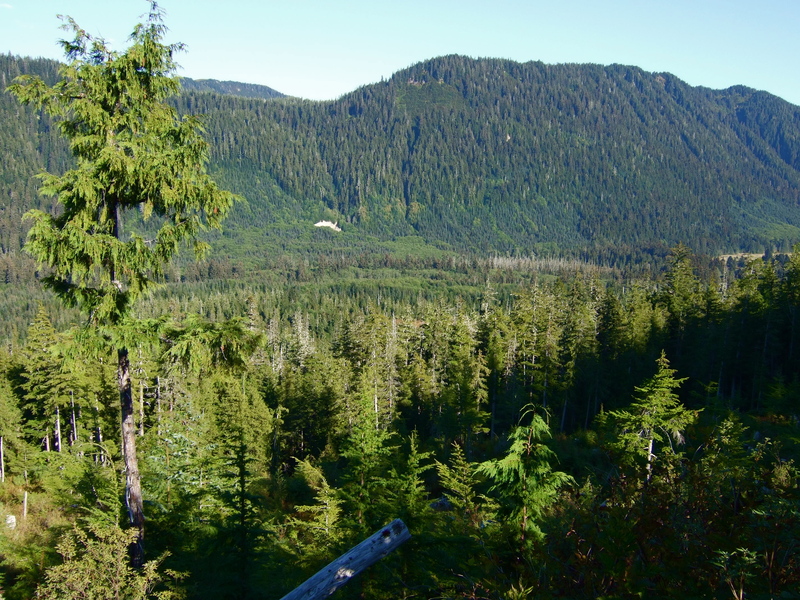 The False Island landscape in the Sitka Ranger District is an ideal location for utilizing stewardship contracting authorities such as best value contracting and collaboration. Stewardship contracting, unlike conventional U.S. Forest Service contracting tools, offers a creative way to incentivize restoration by paying contractors in full or part with the value of the restoration “byproducts” that are extracted during a project. It also allows the agency to award contracts based on overall best value to the government and local communities rather than lowest bid at the time. Stewardship contracts that exercise these authorities are desirable because they address significant challenges to habitat restoration and local economic development faced by rural communities. Stewardship contracting successes in other states provide excellent models of the ecological, social, and economic benefits of this tool, but as the Forest Service works to translate stewardship contracting to the unique geography of the Tongass, there are significant concerns that must be addressed about how and what goals are being met. Stewardship contracting is the primary mechanism under which the U.S. Forest Service can implement best value contracting and enhance local benefits from projects, while responding more nimbly and effectively to mounting landscape-scale restoration needs. The intent of stewardship contracting is to “blend the need to restore and maintain healthy forests with the need to work closely with communities,” which is why collaboration with communities is required throughout a stewardship project. Priority project types include watershed restoration, wildlife and fish habitat, invasive species removal, and other activities related to improving forest health. 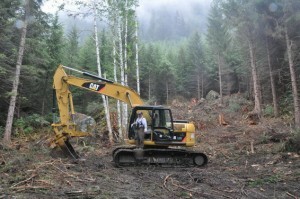 Under stewardship contracting, the Forest Service has several unique authorities at its disposal designed to maximize the value of projects for both the Federal government and the local community. Best value contracting, which can allow the agency to rank bids based on criteria such as “local business” or “materials and supplies purchased locally,” is the only required authority. Others, such as the ability to trade goods for services, may be applied to suit individual projects. Together, stewardship contracting authorities allow local districts to integrate multiple projects into one efficient package; reinvest profits back into the landscapes they came from; actively support local economic development and capacity building; and focus on end result ecosystem benefits. Not all second growth on the Tongass is valuable enough to be used in a "goods for services" transaction during restoration, however, old growth should not be used as a substitute. Although forests in other states have utilized stewardship contracting with great success for almost a decade, southeast Alaska is only just beginning to explore its potential. Experiments with stewardship contracting are taking place on Prince of Wales Island and in Kake, but unresolved questions about how the various authorities can and should be used are stifling experimentation and distracting the agency’s focus from accomplishing broader goals. A particular barrier to implementing stewardship contracts in southeast Alaska has been the “goods for services” authority, which many consider a necessary component of the tool (although as stated above, the only mandatory authority is best value contracting). In states like Oregon, California, and Montana, where restoration projects can be paid for by selling byproducts to local pellet mills and other operations, this authority is a perfect fit. In landscapes like those that dominate southeast Alaska, however—where young growth is less mature, further from markets, and therefore less valuable—it is far less applicable. Although trading goods for services is optional, and only one of many opportunities offered by stewardship contracting, districts in this region have begun resorting to large old growth sales to pay for restoration in a misguided attempt to force a fit. Using old growth to offset restoration costs is unheard of elsewhere in the country and, we believe, a gross misapplication of the law. 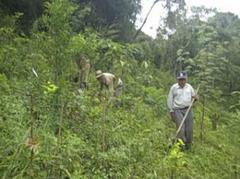 The goods for services authority was designed to encourage local market integration and provide a more economical way to accomplish restoration objectives; large old growth sales do not fit this model, nor do they contribute to a key intent of stewardship contracting, which is to improve forest and watershed health. As successes in the lower 48 have shown, stewardship contracting can be an effective way to enhance local economic development through restoration, but recent experiences in southeast Alaska remind us that focusing too intently on implementing a specific tool can lead to losing sight of the ideals that it represents. In this case, stewardship contracting is not the only method by which the Forest Service can engage in habitat restoration, collaboration with communities, project integration, best value contracting and local capacity building. 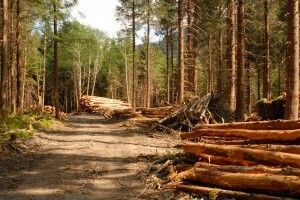 In cases where restoration byproducts have no value, we would like to see the agency concentrate on exercising best value/local benefit contracting, long-term contracts, collaboration, and other applicable authorities; if this is not possible, we suggest that the agency use tools other than stewardship contracting to accomplish these goals. Click here for links to USDA stewardship contracting legislation and policy direction. .“Everything You Wanted to Know about Stewardship End Result Contracting… But Didn’t Know What to Ask.” USDA Forest Service, USDI Bureau of Land Management. Available online at: http://www.fs.fed.us/forestmanagement/stewardship/index.shtml. Protecting ecosystem diversity and finding sustainable ways to use the resources around us are two things that SCS cares deeply about, which is why this recent story on PRX - Food and Forests: Reviving Diversity - caught our eye. It chronicles a pretty inspiring model, based on the work of The Watershed Center in Hayfork, California, for catalyzing sustainable economic development around natural resources in rural communities like Sitka. The first part of this story explores how one rural California community used a restoration economy and sustainable green business model to recover from the loss of 150 jobs and a declining timber industry. It shows how residents learned to work with U.S. Forest Service land managers to manage for biodiversity of the forest, while building upon local skills and the passion for working in the woods that is so deeply ingrained in the community’s social fabric. To help modernize the workforce, The Watershed Center developed educational and training opportunities that would allow local workers to qualify for new restoration jobs, and supported the tertiary manufacturing of timber products to engage high-value markets and socially responsible investors. Community members also explored ways to utilize non-timber forest products such as naturally-occurring medicinal herbs like yarrow, St. John’s Wort, yerba santa, mullein, and Echinacea. They used the surrounding Trinity National Forest’s chemical-free environment as a high-value marketing tool, and leveraged local indigenous knowledge to help revive natural ecosystem patterns diminished by modern management priorities. 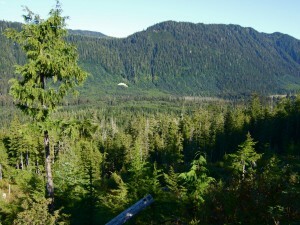 This story is an inspiring example of economic reinvention that demonstrates how we can effectively combine “the preservation and restoration of nature’s original biodiversity with the sustainable harvest and use of resources drawn from it.” In Sitka, we can learn from stories like this as we work toward healthy ecosystems and sustainable economic development in our own landscapes and community. Ocean Boulevard second growth thinned to 25×25' spacing, 2011. BACKGROUND: Clear-cut logging of the forests near False Island between 1967 and 1972 led to fast-paced, even-aged growth of new conifers, shrubs and herbaceous plants that is today causing serious problems for deer and other wildlife. After about 25 years of growth in a previously clear-cut area, conifers become so thick that understory shrubs and herbs are shaded out, virtually eliminating vital deer forage for over 100 years. Restorative thinning of the kind completed during the Ocean Boulevard project can help maintain a more open canopy and better habitat for the deer and other wildlife that local communities depend on for subsistence. Ocean Boulevard was the first of an ongoing series of projects in the False Island landscape aimed at addressing a wide range of resource opportunities related to subsistence, ecosystem restoration, and recreation. Ocean Boulevard benefited from early collaboration with community stakeholders that went above and beyond the traditional U.S. Forest Service process (learn more here). Related projects include the Sitkoh River Restoration and Peril Landscape Opportunities Project. Local contractor Todd Miller creating a "gap" at Ocean Boulevard, 2011. Gaps open the forest and mimic old growth characteristics by creating more structural diversity. This stimulates the growth of plants like blueberry and huckleberry, which provide food for deer and other animals in the winter. STATS: In 2011, local contractor TM Construction thinned 334 acres of young growth forest with treatments that included 25 x 25 foot spacing and canopy gaps. 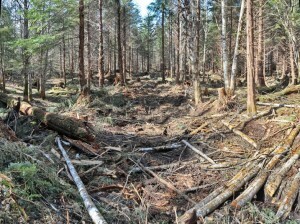 Many of the downed trees were removed by ground-based equipment and either stored in a sort-yard for future sale, or tagged for in-stream use in the Sitkoh River Restoration Project that will be completed in 2012; others were cut into smaller pieces and left to decay in the forest. INNOVATIONS: The U.S. Forest Service took an experimental approach with Ocean Boulevard, using it to test the costs and logistics involved in removing and storing downed trees after thinning. 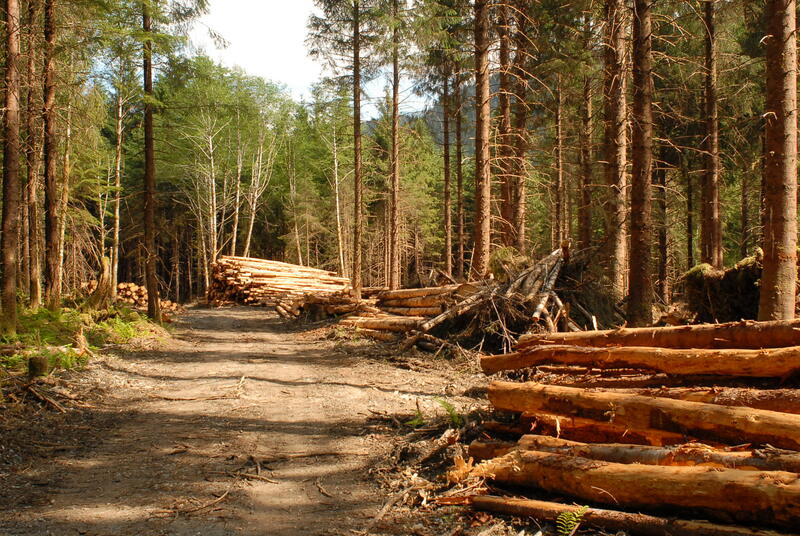 Better understanding these costs will help the Forest Service and community more realistically assess future opportunities to use “restoration byproducts” from the Sitka Ranger District for biomass, lumber, and other timber products. 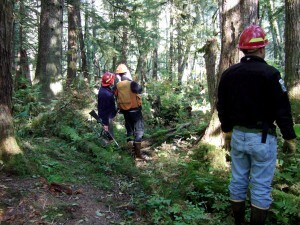 was the first U.S. Forest Service project to involve input from the Sitka Collaborative Stewardship Group (SCSG). Check out our briefing sheet to learn more about community input on the Ocean Boulevard Project: Ocean Boulevard Briefing Sheet. BACKGROUND: The Peril Project is a collaborative stewardship initiative designed to improve wildlife habitat and recreational access within the False Island/Peril Strait landscape. Planning for Peril officially began in 2010, but the “landscape-scale” project concept is rooted in three efforts that began as far back as 2006: the U.S. Forest Service False Island Integrated Resource Management Plan (IRMP) planning group, the Sitkoh River and Creek Watershed Inventory and Restoration Plan (2009) and the Sitka Collaborative Stewardship Group (2009). The Ocean Boulevard Wildlife Improvement Project, completed in 2011, was the first project to transpire from these collaborative efforts to improve the False Island landscape. The Sitkoh River Restoration was the second, and will be completed in 2012. 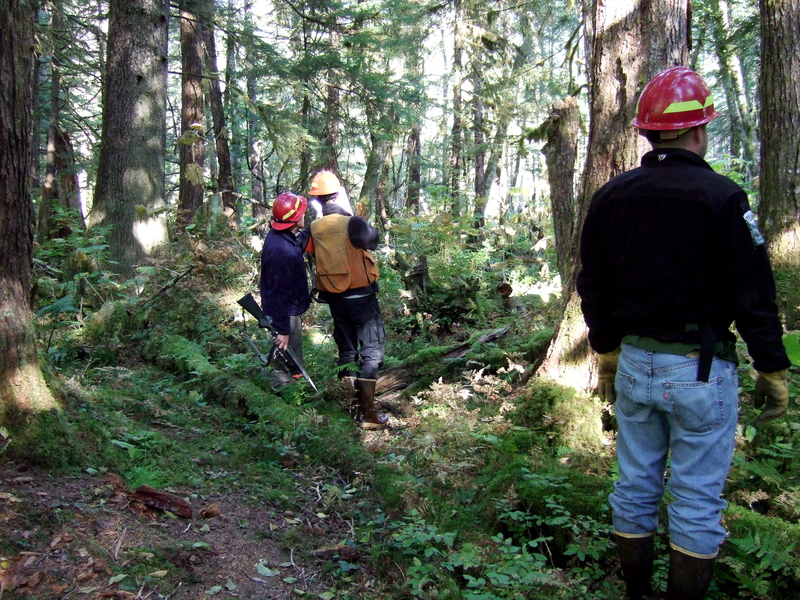 The Sitka Collaborative Stewardship Group, which was originally formed to develop community-based stewardship opportunities related to Tongass management, organized two public meetings in 2010 to share information and gather collaborative input on Peril. These meetings were attended by a wide range of community stakeholders, and resulted in stewardship suggestions that can be read here (May 2010) and here (December 2010). Click here for a copy of the 2011 Peril Project Environmental Assessment (EA). 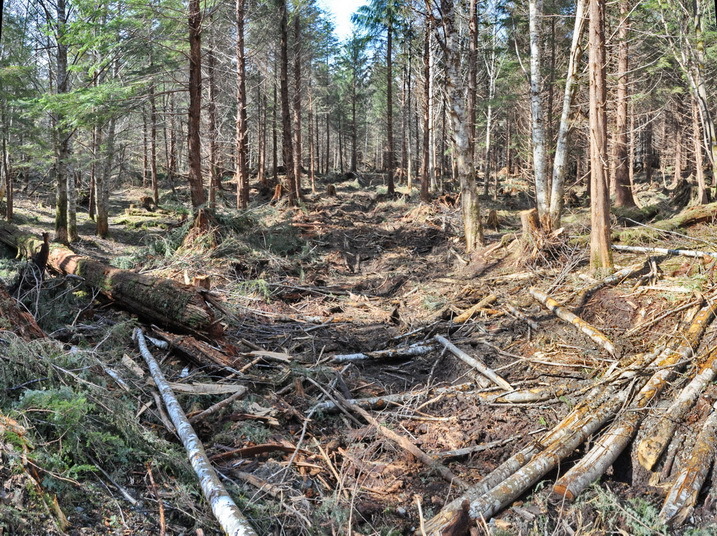 INNOVATIONS: Peril is one of the first projects in the Sitka Ranger District in which collaborative input from the Sitka Collaborative Stewardship Group and other community partners has been prioritized. The goal is to better integrate community priorities into Forest Service planning efforts in the SCUA, and SCS will continue to engage in similar opportunities with the Forest Service and community partners.